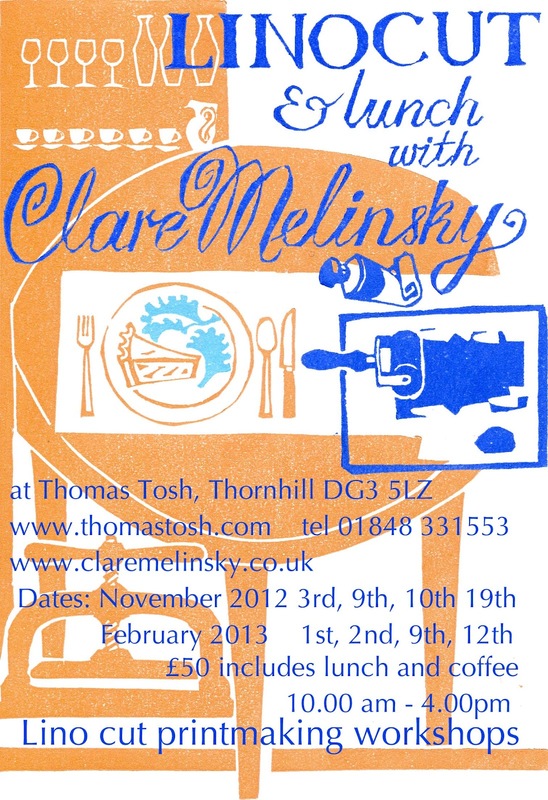 Clare Melinsky is running more of her popular lino cut one-day workshops this November at Thomas Tosh. Clare will help you design your own work of art, from greetings card designs to special prints you can take home. 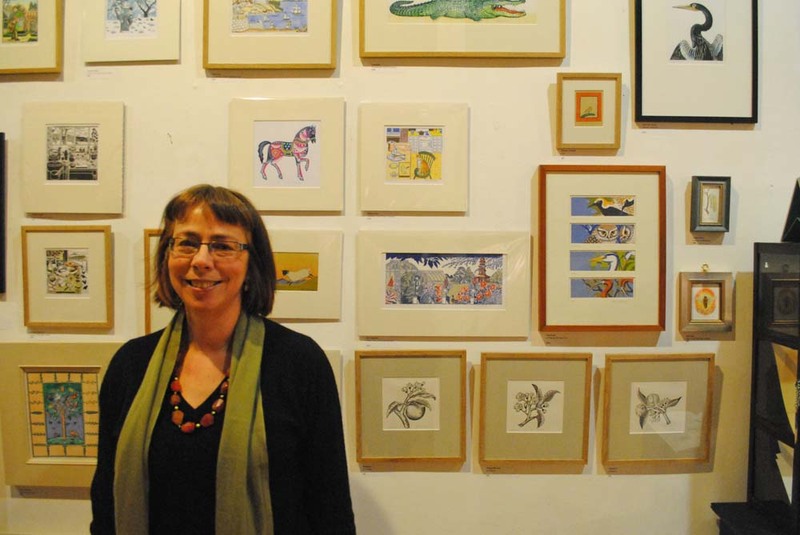 Learn great skills from this respected print maker whose illustrations have graced Royal Mail stamps, Shakespeare and Harry Potter editions, adverts and labels, and newspaper columns. The November workshops take place on Saturday 3rd, Friday 9th and Saturday 10th, and Monday 19th. Beginners and returning students are welcome; minimum age 16; only six students per session. 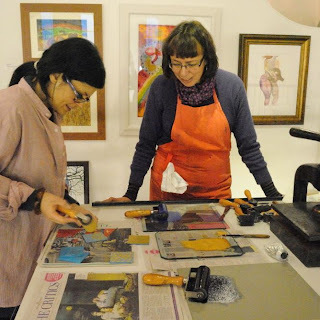 Clare also notes that by attending more than one workshop, you will be able to build on previous work and skills to create more elaborate prints. This might work particularly well for people who choose to attend both the November 9th and 10th workshops. Clare is also running workshops in February 2013. The dates are: Friday 1st, Saturday 2nd, Saturday 9th, Tuesday 12th. Booking is now open for those sessions too. Our latest exhibition gives a martial twist to the tradition of the Dumfries and Galloway landscape. Slade School of Art graduate Emma Gray has spent the last year scanning the sky over Thornhill and our surrounding areas for low flying military aircraft. Emma's distinctive landscapes always stand out, but they've an added dimension with the mechanical might of the RAF. Customers Beth & Val (centre) with Hugh enjoying the Local Types pamphlet. 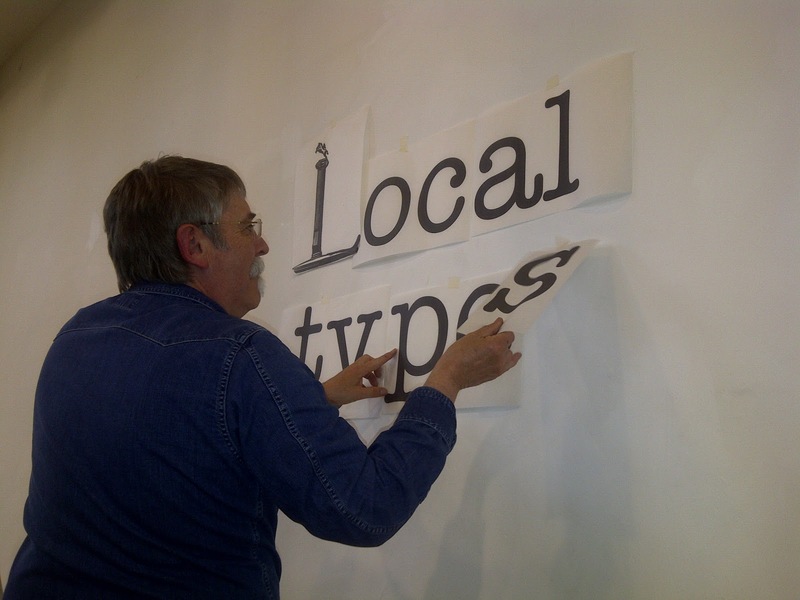 It's the final seven days of the Local Types exhibition at Thomas Tosh. Hugh Bryden's 'prinstallation' of local nicknames has been amusing lots of customers. Pamphlets of the exhibition are also available. The exhibition runs until 14th July, Thornhill Gala Day. 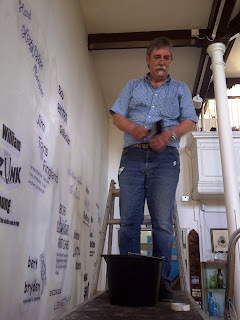 Hugh Bryden is putting the finishing touches to the Local Types exhibition this week. Thomas Tosh customers have been leaving suggestions of nicknames to be added to the wall over the past few weeks. Hugh will be putting the last of these up. And this coming Saturday (30th June), he'll be launching the pamphlet of the exhibition. It's filled with his great visualisations of nicknames, and will be a memento once the exhibition disappears forever after the 14th July. The pamphlet launch is at 3pm. 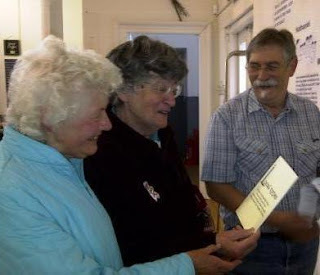 Local author Ronald Turnbull will be bringing to life the fierce history of some of the finest glens and valleys in the region next Tuesday (12th June) at Thomas Tosh in Thornhill. 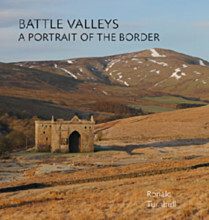 Ronald will be launching his new book on the historic and violent background of what he calls 'the Battle Valleys'. He'll give a talk with accompanying slide show, and will take part in a question & answer session. Entry is free. The event starts at 7.30pm and there's a licensed bar with refreshments. Copies of the new book, priced £16.99 will be available to buy. And Ronald will be happy to sign editions. It's the launch weekend of the Dumfries and Galloway Arts Festival, and Thomas Tosh's wall has become a riot of local nicknames as part of the festivities. Hugh Bryden has worked with local customers, and residents to turn nicknames into pictures in what he likes to call a `printstallation'. It's a unique project, combining humour with the growing interest in typography. It's well worth a visit. Entry is free. And Hugh's work is not yet entirely complete. If you have any ideas of nicknames that you think should go up on the wall, he wants to hear. Thanks to Dumfries and Galloway Arts Festival for its collaboration, and to Margaret Marchbank, Jane, Mary, and Anne for the inspiration. It's a Salon Special tonight (Tuesday 8th May) at Thomas Tosh. Hugh Bryden is going to begin his work on Local Types, as part of the Dumfries and Galloway Arts Festival. It is an installation celebrating local wordplay: from nicknames to stories. Tonight, Hugh will have his pen poised to put into pictures local nicknames from the past and present. So please come along with your ideas. Those ideas will help in Hugh's work, which will cover the gallery space at Thomas Tosh. Hugh McMillan will be joining us too. He's reading from his latest poetry collection Thin Slice of Moon. The event starts from 7.30pm. Entry is free. There's cakes, coffee and a licensed bar. Melville Brotherston will be with us tomorrow Saturday April 14th. He'll be around from 12 noon to 2pm to chat to customers about his new show, Points North & West. The exhibition demonstrates Melville’s continued fascination with colour and light—and the ability of the landscape to fire the imagination. Melville's taken inspiration from the dramatic mountains and seas of Wester Ross and Sutherland, and other points in North, West and South West Scotland. 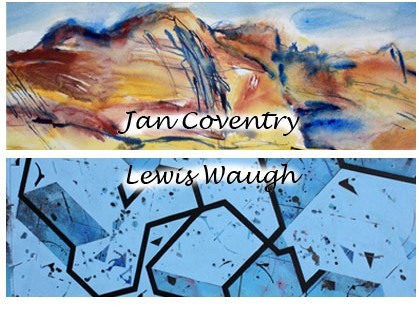 He's used watercolours, oils and mixed media in the recent work that will be on show. Points North & West marks his first solo exhibition at Thomas Tosh in three years. Please pop in and see us if you are around. Jane Blair will be with us this coming Saturday (17th March) from 11am-3pm in what's going to be a bumper weekend at Thomas Tosh. 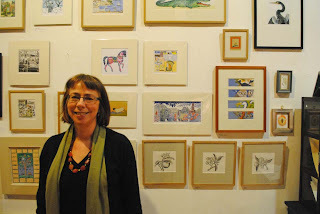 Jane will be on hand to chat about her latest exhibition, While Walking the Dog. Given its title, it’s not surprising that the show features a range of landscapes and rural animal paintings by the popular Nithsdale-based artist. But the exhibition also demonstrates Jane’s love of marine life. “The fish thing is a bit of a passion,” explains Jane. “If I'm anywhere near an aquarium when the weather is too bad for painting, I love to go in for a warm up. That warmth and serene coolness comes out in Jane’s work. And there will be an extra chance to catch the exhibition as Thomas Tosh opens this Sunday 18th March from 11am-4pm to celebrate Mother’s Day. To book lunch on the Sunday for our usual delicious menu please call: 01848 331 553. 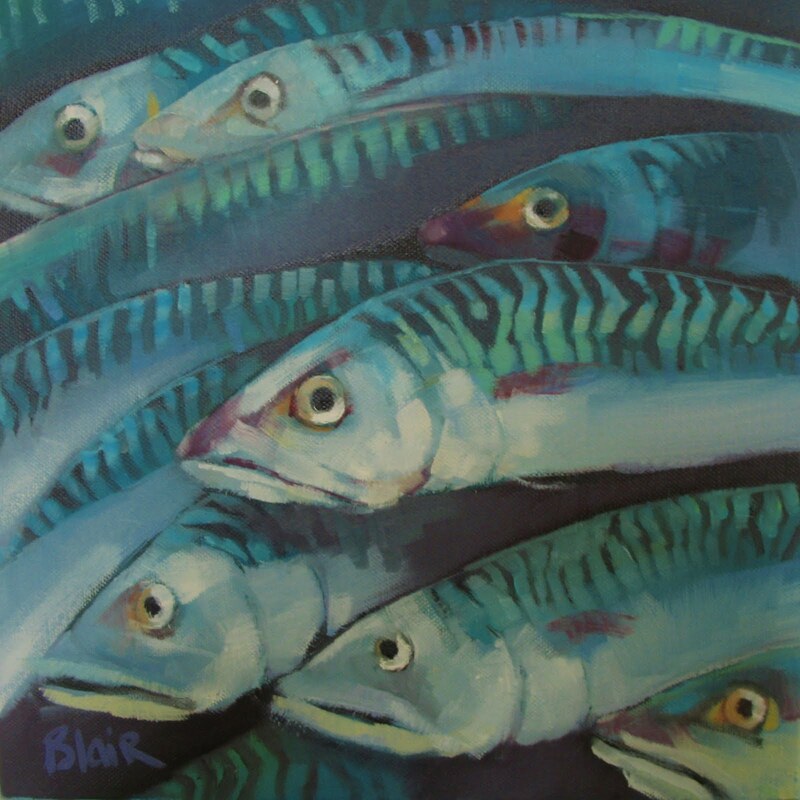 Paul O'Keeffe writes: Jane Blair's new exhibition starts today March 6th and continues until the 31st March. 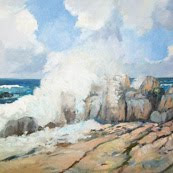 There's a good range of oils from marine life, to rural animals, to landscapes; in a cool and relaxed palette. It's not sentimental, but there is a theatrical flourish here and there. Jane's going to be in at Tosh a week Saturday (17th March) to chat to customers about the exhibition. Free entry of course. There's just over a week and a half left to see Clare Melinsky's exhibition Cabbages & Kings. It's been a very popular show with visitors enjoying Clare's great range of work. Clare is also conducting one extra lino-cut workshop on Saturday 3rd March, 10am-4pm. Like the others, it costs £50 including a Thomas Tosh lunch and morning and afternoon refreshments, and you create a piece of work to take away with you. You can book here. Thanks to Ronald Turnbull for the picture of Clare overseeing Sylvia at the first workshop. Paul O'Keeffe writes: There's an extra Clare Melinsky workshop being held on Monday 20th February 10am-4pm. The workshop on the 27th is now full. If you'd like to attend call us on 01848 331 553. Or you can book here. The workshop costs £50 and includes lunch and morning and afternoon refreshments. Clare will show you how to create lino cut prints, and you'll have completed work to take away with you. 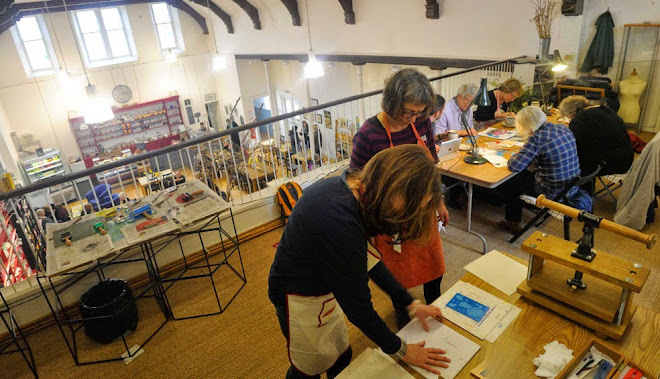 Clare Melinsky is running a workshop at Thomas Tosh tomorrow ( Saturday 4th February 10am-4pm) in the art of lino-cutting. It's the printing technique Clare uses in her illustrations that can be seen on Harry Potter covers, stamps, in newspapers and magazines, on marketing material, and in her fine art. The workshop costs £50 per person and includes lunch and morning and afternoon tea/coffee with a slice or scone. The workshop takes place at Thomas Tosh, the Old Parish Hall, 19 East Morton Street, Thornhill, Dumfriesshire. DG3 5LZ. Tel: 01848 331 553 for more details and to book a place. If you can't make tomorrow, Clare will be running another workshop on Monday 27th February. And you can always catch Clare's exhibition at Tosh, which launched last Tuesday (that's Clare and part of the show in the picture above). Entry to the exhibition is free, and it runs until March 3rd. 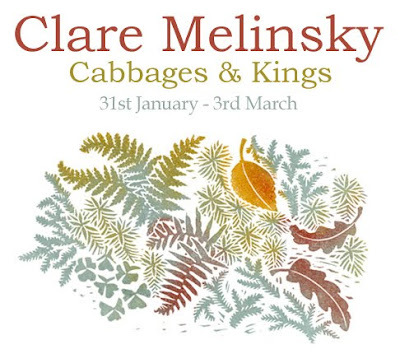 Please join us if you can this evening (Tuesday 31st January) for the launch of Clare Melinsky's latest exhibition: Cabbages and Kings. There is a huge range of work on show. And Clare will be with us as from 7.30pm. You can read more about the exhibition and two special workshops we are holding here.